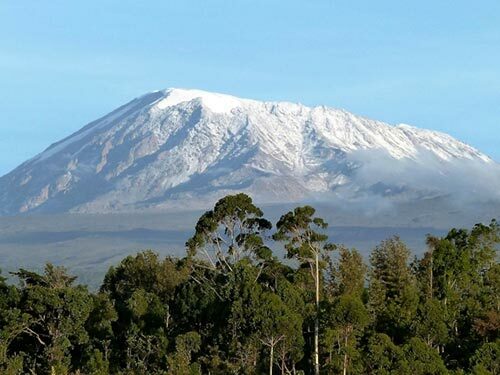 The highest mountain in Africa, approximately 4.900 metres, based in Tanzania, a true masterpiece of Mother Nature, yes of course we are talking about the magical Mount Kilimanjaro. The mountain is a dormant volcano and has three volcanic cones named ‘Kibo’, ‘Shira’ and ‘Mawenzi’. Shira and Mawenzi are extinct, but the highest peak Kibo, is dormant and could erupt again. The last major eruption was circa 360,000 years ago and the most recent activity was just about 200 years ago. In 1889, the first persons reached the summit of Mount Kilimanjaro. Now days, the mountain is a major climbing destinations, about 36,000 people attempt to climb the mountain each year. Mount Kilimanjaro is a very popular mountain to climb. One of the main reasons is that the mountain is located in Tanzania, you can combine the amazing hike with a safari in the incredible Serengeti, the jewel in the crown of African national parks. The Serengeti is one of the ‘Seven New Wonders of the World’ and is famous for its annual wildebeest migration. Thousands and thousands of wildebeest, zebra and gazelle move to places where there is enough food. Another reason of the popularity of Kilimanjaro is its accessibility of the mountain. The weather is fairly stable, temperatures may drop below freezing but nothing like temperatures at Mont Blanc or Mount Everest. The summit is well staffed with porters, well organized and it isn’t that risky to climb. Due to its proximity to the Equator, the mountain doesn’t have a huge snow-cap. Most of the trails are normal hiking trails, which means that you don’t need technical ice climbing skills to make it to the summit. There are seven different routes to reach the summit of Mount Kilimanjaro. To select a route that is fitting for you can be a tough choice. You have to think about the difficulty of the route, the route’s scenery, it’s acclimatization and about the duration of your trip. Let Ashanti Travel Online help you to find the perfect route for you.Reaching the summit of Mount Kilimanjaro is a one in a lifetime experience and a journey that you will never forget.